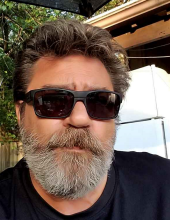 Jeffrey Michael Bibb, 61, of Richmond, passed away Saturday, April 13, 2019 at his home. Jeffrey, the son of Millard Philmore “Phil” Bibb and Maxine Castleberry Bibb, was born in Clarksville, TN on September 25, 1957. He lived a simple, no frills life. He loved his family and friends, humor and music, especially the genre of outlaw country. On July 1, 2000, Jeff united in marriage to Dawn Mullins-Bibb who survives. Other survivors include one son: Colin Michael Bibb; his daughter: Danielle Mullins Bibb both of Richmond; one brother and sister-in-law: Scott and Gaynor Bibb and his sister: Phyllis Zimmerman. A Memorial Service is to be scheduled at a later date. "Email Address" would like to share the life celebration of Jeffrey Michael Bibb. Click on the "link" to go to share a favorite memory or leave a condolence message for the family.